SOBIPro is a powerful Joomla extension from Sigsiu.NET for building custom directory components. SOBIPro is highly customizable with which you can build any kind of directories for example Membership Directory, Business Directory, File Directory or even a Photo Gallery. The templating system and custom fields design makes SOBIPro one of the best directory components available in the market. Also SOBIPro comes with an application manager which allows you to install additional field types, templates and language packs of your choice. 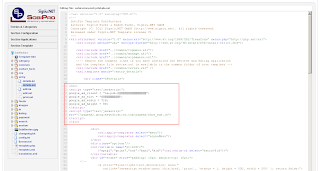 How to insert AdSense code in directory entries? Go to your SOBIPro template and open entry\details.xsl file for editing. Now place the AdSense code at the location where you want to display your Ad. In the screenshot given on the right, the code is placed before the entry title so that a banner Ad will be displayed just above the entry. 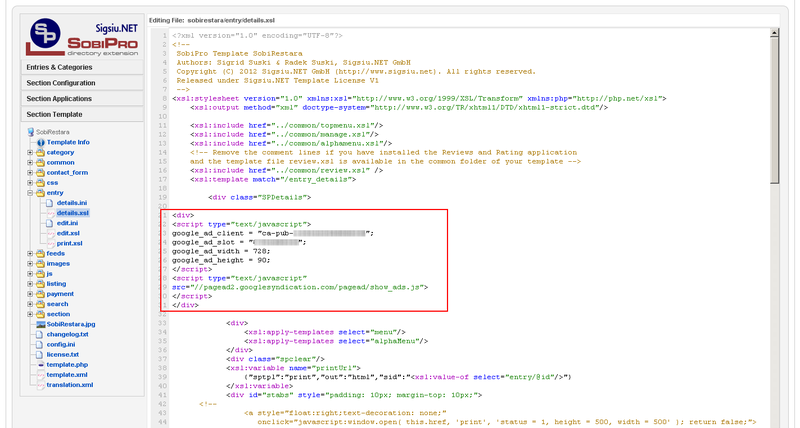 Remove <!-- and //--> tags and all comments from the AdSense code. Save your template and refresh your page. Ads will be displayed on all of your item pages if you have followed the instructions carefully! Blank screen - Make sure all the HTML tags are closed properly. No Ads displayed - Wait for 5-10 minutes if the Ad unit is newly created.